Issues of cultural appropriation and identity are complicated. Power dynamics influence who benefits from certain cultural experience, and—given the global nature of our world—parts of our individual and cultural identities are shaped by cultures other than our own. How do we make sense of this and what effect does it have on us as individuals and as Oregonians? This is the focus of “What is Cultural Appropriation?,” a free conversation with Surabhi Mahajan on April 16, 2019, at 7 p.m. at the Walters Cultural Arts Center (527 E. Main Street, Hillsboro). This program is sponsored by Oregon Humanities. Surabhi Mahajan is a longtime resident and active community member in Salem, Ore., who works for food access in her community. 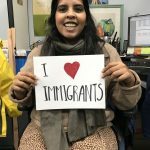 Her experience as part of a family of immigrants and a woman of color with a college education has helped her understand how different aspects of her culture have informed her place in the world. She looks forward to meeting with fellow Oregonians to discuss how cultural appropriation shapes individuals’ experiences and identities. Oregon Humanities is an independent, nonprofit affiliate of the National Endowment for the Humanities and a partner of the Oregon Cultural Trust. Committed to bringing people together across difference, Oregon Humanities connects Oregonians to ideas that change lives and transform communities. Through the Conversation Project, Oregon Humanities offers free programs that engage community members in thoughtful, challenging conversations about ideas critical to our daily lives and our state’s future. More information about Oregon Humanities’ programs and publications can be found at OregonHumanities.org. This program is part of the Creative Connections Speaker Series at the Walters, a series of free talks and performances by speakers and artists from the creative community. Past events have included storytelling, artist’s talks, lectures, literary readings, engaging discussions, and more. These free events take place throughout the year and invite members of the community to spark their creativity and stir their curiosity as they make new creative connections. The Walters is a ground-breaking home for creativity and culture providing expanded opportunities for the entire metro area community, including increased access to exceptional performing and fine arts experiences. The Walters is located just two blocks off the MAX Blue line in historic downtown Hillsboro.